A lecture by Srila Prabhupada on Srimati Radharani’s Appearance Day celebrations held in Montreal on Aug 30th 1968. Today is our Radhashtami ceremony. I must speak now something about Radharani, and then I shall go up, reach my apartment at twelve. In the meantime, you can observe the ceremonies. Today is the birthday of Srimati Radharani. Radharani is the pleasure potency of Krishna. Krishna is the Supreme Brahman. Just try to understand. Krishna is the Supreme Brahman. Param brahma param dhama pavitram paramam bhavan [Bg. 10.12]. So when param brahma wants to enjoy… That enjoying spirit is there in the param brahma. Otherwise we cannot have this enjoying spirit. Because we are part and parcel, therefore we have got that enjoying spirit; but that is materially contaminated. But the fact is there, because Krishna, He is enjoying, this enjoying spirit we have got also, but I do not know how to enjoy. We are trying to enjoy in the matter, in the dull matter. That is spiritual. So brahman, brahman sukhanubhutya. People are trying to feel what is brahma-sukha, pleasure of brahmanubhava. That is not material pleasure. So many yogis, they have given up their family life, their kingdom, and meditating to achieve that Brahman pleasure. Actually, the idea is Brahman pleasure. So many brahmacharis, so many sannyasis, they are trying to achieve that Brahman pleasure, and in order to achieve that Brahman pleasure they are neglecting, they are kicking off all this material pleasure. “Oh, in the field.” Just see. Radharani’s janma is like that. So this janma is today and Radha, this name is sometimes not found in Bhagavata. So the atheistic class of men protest this Radharani’s name is not in the Srimad-Bhagavatam. How this name came, Radharani? But they do not know how to see it. There is anayaradhyate. There are many gopis, but there is mention that by this particular gopi He is served more pleasingly. Krishna accepts this gopi’s service more gladly. Anayaradhyate.Aradhyate. This word, aradhyate means worshiping. 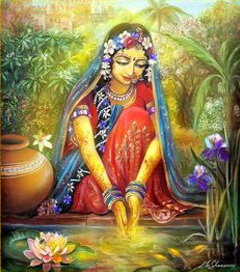 From this word aradhyate, Radha has come. But Radha’s name is there in other Puranas. So this is the origin. So Radha and Krishna. Krishna is the enjoyer and He wants to enjoy. So He’s the Supreme Brahman. He cannot enjoy anything, atmarama; He can enjoy it in Himself. 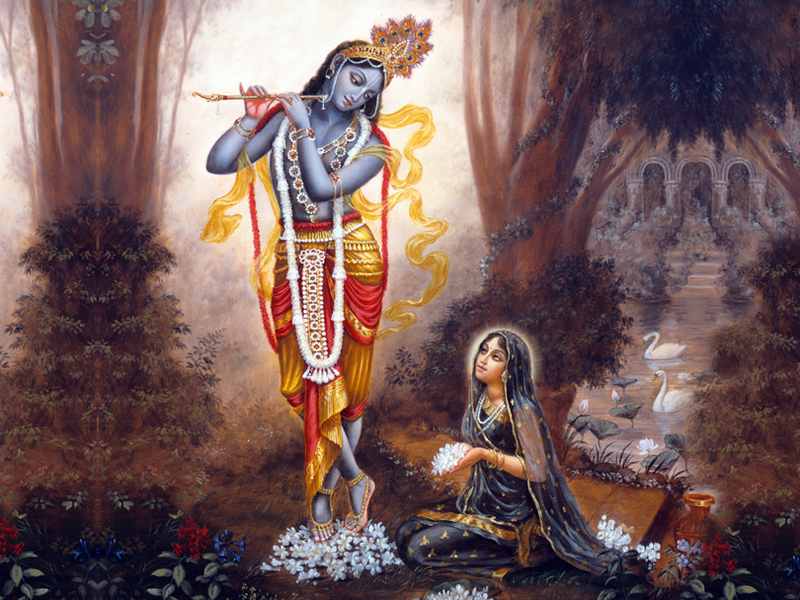 Therefore Radharani is the expansion of His pleasure potency. Krishna hasn’t got to seek external things for His pleasure. No. He is in Himself full, atmarama. So Radharani is expansion of Krishna. Krishna is the energetic, and Radharani is the energy. Just like energy and energetic, you cannot separate. Fire and the heat you cannot separate. Wherever there is fire there is heat, and wherever there is heat there is fire. Similarly, wherever there is Krishna there is Radha. And wherever there is Radha there is Krishna. They are inseparable. But He is enjoying. So Svarupa Damodara Gosvami has described this intricate philosophy of Radha and Krishna in one verse, very nice verse. Radha krsna-pranaya-vikrtir hladini-saktir asmad ekatmanav api bhuvi pura deha-bhedam gatau tau [Cc. Adi 1.5]. So Radha and Krishna is the one Supreme, but in order to enjoy, They have divided into two. 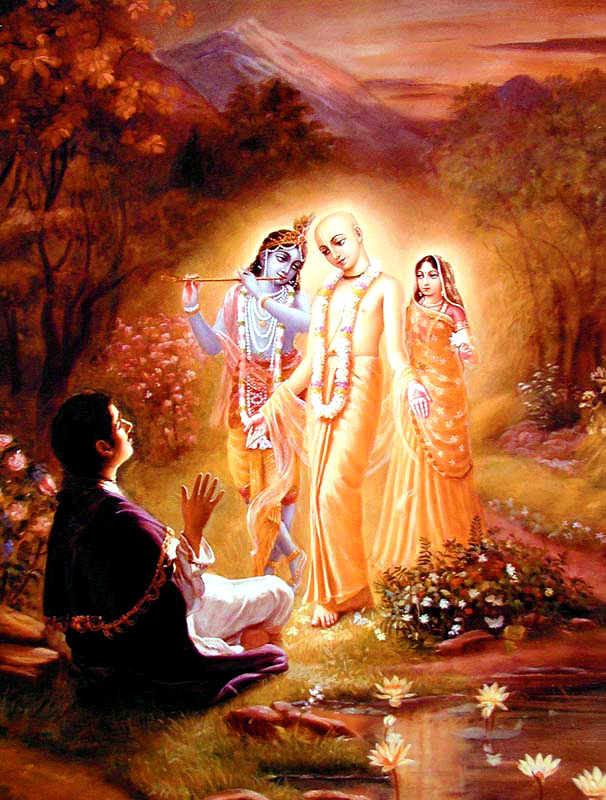 Again Lord Chaitanya joined the two into one. Caitanyakhyam prakatam adhuna. That one means Krishna in the ecstasy of Radha. Sometimes Krishna is in ecstasy of Radha. Sometimes Radha is in ecstasy of Krishna. This is going on. But the whole thing is Radha and Krishna means the one, the Supreme. So Radha-Krishna philosophy is a very great philosophy. It is to be understood in the liberated stage. Radha-Krishna philosophy is not to be understood in the conditioned stage. But when we worship Radha-Krishna in our conditional stage, actually we worship Lakshmi-Narayana. You have seen that picture, this viddhi-marga and raga-marga. Radha-Krishna worship is on the platform of pure love, and Lakshmi-Narayana worship is on the regulative principles. So long as we do not develop our pure love; we have to worship on the regulative principles. One has to become a brahmachari, one has to become a sannyasi, one has to perform the worship in this way, in the morning he has to rise, and he has to offer. So many rules and regulations. There are at least sixty-four rules and regulations. So we shall introduce them gradually as you develop. So in the viddhi-marga, when you have no love for God or Krishna, we have to follow the regulative principles and automatically…, there is practice. When practicing. Just like you practice this mridanga playing. In the beginning it is not in order, but when you become well versed in the practice, the sound will come so nice. Similarly, when we are engaged by regulative principles in the worship of Radha-Krishna, that is called viddhi-marga. And actually when you are on the love platform, then that is called raga-marga. So without viddhi-marga, if anyone wants to learn the raga-marga immediately, that is foolishness. Nobody can pass M.A. examination without going through the regulative principles of primary schools and colleges. So therefore, I mean to say, indulge in the discussions of Radha and Krishna so easily. Rather go on with the regulative principle at the present moment. Gradually, as you become purified, as you become on the transcendental platform, you’ll understand what is Radha-Krishna. Don’t try to understand Radha-Krishna very quickly. It is a very big subject. If we want to understand Radha-Krishna very quickly, then there will be so many prakrta-sahajiyas. In India there are prakrta-sahajiyas. Just like Radha-Krishna dancing. Radha-Krishna has become a plaything. The painting Radha-Krishna, Krishna is kissing Radha, Radha is kissing. These are all nonsense. Radha-Krishna philosophy has to be understood by the liberated person, not by the conditioned soul. So we shall wait for the fortunate moment when we are liberated, then we shall understand radha-krsna-pranaya-vikrtir. Because Krishna and Radha, They are not on the material field. Try to understand. This is Jiva Gosvami’s analysis, that Krishna is the Supreme Brahman. The Supreme Brahman cannot accept anything material. So Radha is not in the material field.